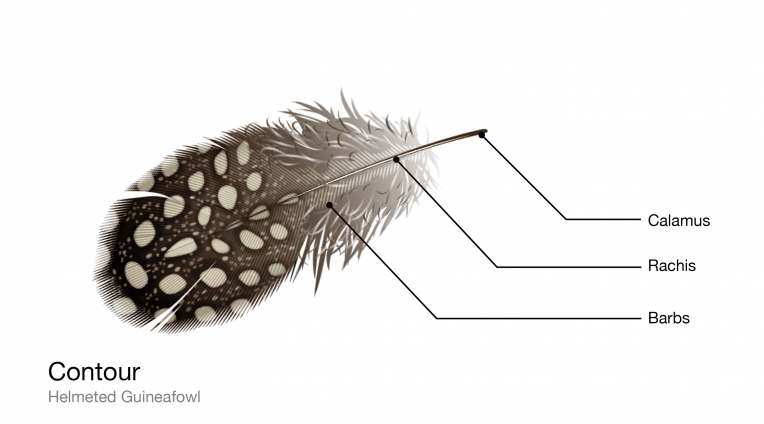 Feather Anatomy: How Do Feathers Work? Although feathers come in an incredible diversity of forms, they are all composed of the protein beta-keratin and made up of the same basic parts, arranged in a branching structure. In the most complex feathers, the calamuscalamusCAL-a-mussthe hollow barbless base of a feather’s stiff central shaft extends into a central rachisrachisRAY-kissthe stiff central shaft of a feather from which barbs branch which branches into barbsbarbone of the main branches off the central shaft of a feather, and then into barbulesbarbulebarb-YOOLone of the secondary branches off a feather barb with small hooks that interlock with nearby barbules. The diversity in feathers comes from the evolution of small modifications in this basic branching structure to serve different functions. Downy feathers look fluffy because they have a loosely arranged plumulaceousplumulaceousploom-yoo-LAY-shusshaving a loose, non-interlocking feather structure microstructure with flexible barbs and relatively long barbules that trap air close to the bird’s warm body. Pennaceouspennaceouspen-AY-shusshaving an interlocking feather structure that creates a smooth surface, or vane feathers are stiff and mostly flat, a big difference that comes from a small alteration in structure; microscopic hooks on the barbules that interlock to form a wind and waterproof barrier that allows birds to fly and stay dry. 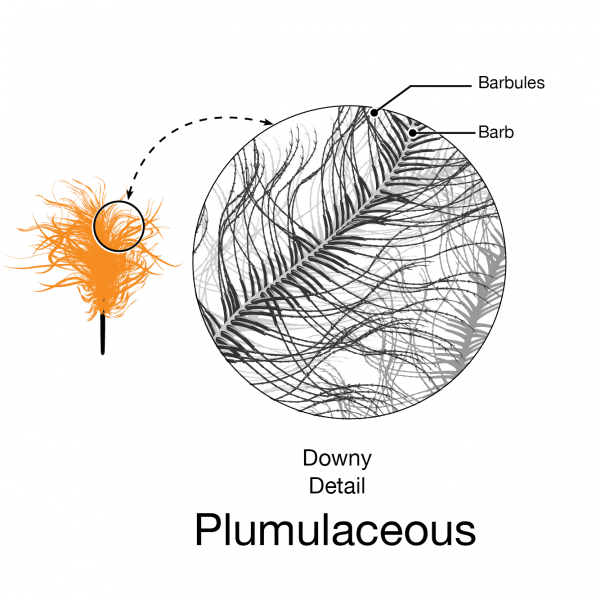 Many feathers have both fluffy plumulaceous regions and more structured pennaceous regions. Feathers fall into one of seven broad categories based on their structure and location on the bird’s body. The wing feathers specialized for flight are characterized by uniform windproof surfaces, or vanes, on either side of the central shaft that are created by an interlocking microstructure. Also called remigesremigesREM-i-jeezthe flight feathers on the wing that are attached to bone rather than only to skin, these feathers are asymmetric with a shorter, less flexible leading edge that prevents midair twisting. Most tail feathers, or rectricesrectricesRECT-ri-seestail feathers, feature an interlocking microstructure similar to wing feathers. 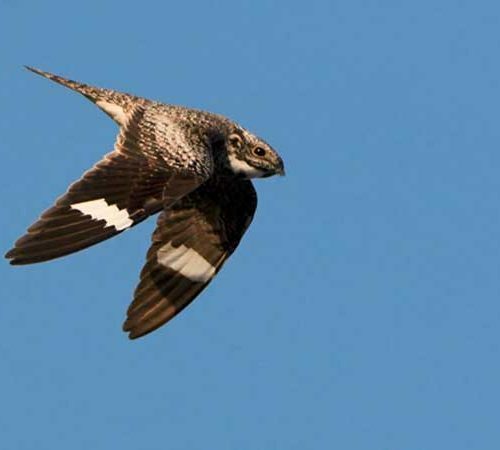 Arranged in a fan shape, these feathers support precision steering in flight. Typically, birds have six pairs of feathers on the tail, which display increasing levels of asymmetry toward the outer pairs. 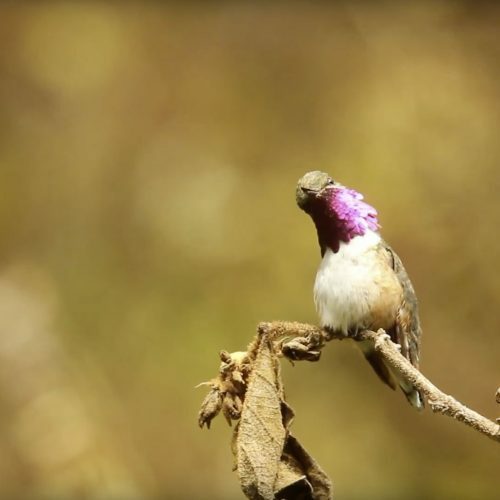 In some birds, tail feathers have evolved into showy ornaments that are useless in flight. Contour feathers are what you see covering the bird’s body and streamlining its shape. Arranged in an overlapping pattern like shingles, the waterproof tips are exposed to the elements and the fluffy bases are tucked close to the body. Sometimes brilliantly colored or uniformly drab, contour feathers can also help the bird show off or stay camouflaged. Contour feathers on the wing, called covertscovertsCOH-vertsoverlapping feathers that shape the wing into an efficient airfoil, shape it into an efficient airfoilairfoilwinglike structure that produces lift and drag as it moves through the air by smoothing over the region where the flight feathers attach to the bone. Mostly hidden beneath other feathers on the body, semiplumes have a developed central rachis but no hooks on the barbules, creating a fluffy insulating structure. Similar to semiplumes with an even looser branching structure but little or no central rachis, down feathers are relatively short and positioned closest to the body where they trap body heat. Short simple feathers with few barbs, filoplumes function like mammal whiskers to sense the position of the contour feathers. Bristles are the simplest feathers, with a stiff rachis that usually lacks barb branches. Most commonly found on the head, bristles may protect the bird’s eyes and face. Download the accompanying Animated Slide set. 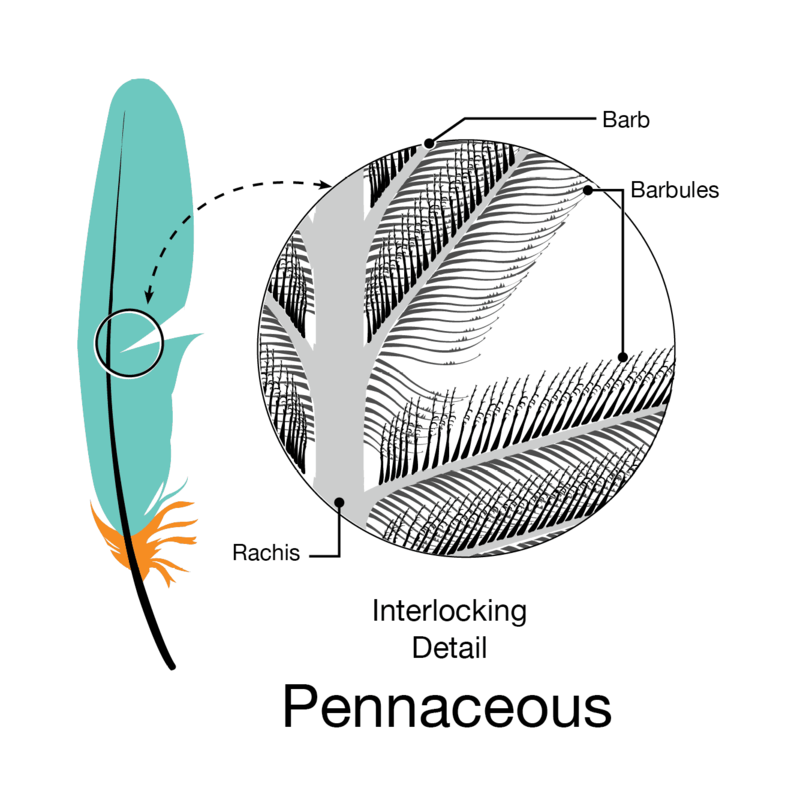 Learn more about feather anatomy and peek at microscopic feather structure.